Ohio University Press, 9780821422809, 400pp. 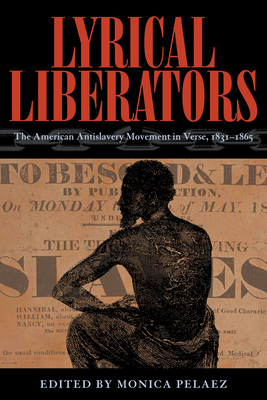 In Lyrical Liberators, Monica Pelaez draws on unprecedented archival research to recover these poems from the periodicals—Garrison’s Liberator, Frederick Douglass’s North Star, and six others—in which they originally appeared. The poems are arranged by theme over thirteen chapters, a number that represents the amendment that finally abolished slavery in 1865. The book collects and annotates works by critically acclaimed writers, commercially successful scribes, and minority voices including those of African Americans and women. Monica Pelaez is an associate professor of English at St. Cloud State University. She holds degrees from Princeton and Brown. Her research focuses on nineteenth-century American poetry, and she has published essays on Emily Dickinson, Henry Wadsworth Longfellow, and Edgar Allan Poe. She lives in Minneapolis.